We’d love your help. Let us know what’s wrong with this preview of Becoming Bodhisattvas by Pema Chödrön. 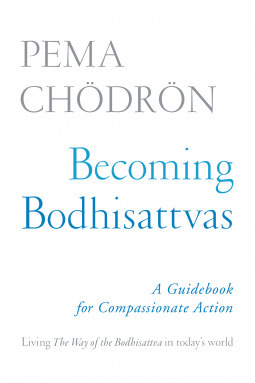 Best-selling American Buddhist nun Pema Chödrön presents a friendly and encouraging guide to spiritual practice for all those who want to take up the path of the bodhisattva--one who aspires to live life with courage, generosity, patience, fearlessness, and compassion. The Way of the Bodhisattva has long been treasured as an indispensable guide to enlightened living, offeri Best-selling American Buddhist nun Pema Chödrön presents a friendly and encouraging guide to spiritual practice for all those who want to take up the path of the bodhisattva--one who aspires to live life with courage, generosity, patience, fearlessness, and compassion. Published September 4th 2018 by Shambhala Publications, Inc.
To ask other readers questions about Becoming Bodhisattvas, please sign up. A selection from Iphelia.com’s Editor’s Bookshelf review: I initially thought Becoming Bodhisattvas was a novel text written by Chödrön herself, but it’s actually a commentary on The Way of the Bodhisattva, an eighth-century teaching by the Buddhist monk Shantideva. So, I literally stumbled into reading my first long-form Sanskrit verse, and thanks to Chödrön’s careful dissection and annotation of the ten-part text, I made it through—thinking and feeling a great deal along the way. I appreciate t A selection from Iphelia.com’s Editor’s Bookshelf review: I initially thought Becoming Bodhisattvas was a novel text written by Chödrön herself, but it’s actually a commentary on The Way of the Bodhisattva, an eighth-century teaching by the Buddhist monk Shantideva. So, I literally stumbled into reading my first long-form Sanskrit verse, and thanks to Chödrön’s careful dissection and annotation of the ten-part text, I made it through—thinking and feeling a great deal along the way. I appreciate that the book doesn’t assume the reader is Buddhist or considering “converting to Buddhism” (whatever that means). Chödrön speaks to anyone who’s willing to stick with her as she explores what becoming a bodhisattva means, and points out examples of bodhisattvas including Jesus, Mother Teresa, MLK, and Gandhi, who may be more relatable to her Western readers than Shantideva or various monks in the Tibetan Buddhist tradition. That said, if you’re at all familiar with the chakras, it’s worth noting that the first four chapters of the book speak to the third eye, which is to say they will have you operating from your headspace. It was not until the fifth chapter, which begins Chödrön’s presentation of Shantideva’s verses on taming the mind (or working with anger), that I was able to drop in and really start feeling nourished by the text. Even then, Shantideva relies heavily on the shock-and-scare language of his time, which Chödrön acknowledges may not be best for Westerners considering we have our own distinct struggles with the material world and relating to our bodies that Shantideva couldn’t possibly have taken into account. The text also oscillates in its treatment of feelings, expression, and “childishness” or the childlike parts of the self. While I am convicted that “making friends with our feelings” (language Chödrön uses but then seems to renege on), giving them healthy expression (not just trying to meditate them away), and tuning into our child selves (who are sweet, pure, and hopeful, not ignorant and selfish) is of the utmost importance, I’m still unclear on what Chödrön’s insights are in these areas. Any acknowledgment of all the literature and evidence we have on trauma and abuse is completely lacking in this text, which significantly diminishes its practical value. It’s a powerful inspirational read that definitely does the work of awakening the spirit, inspiring empathy, and encouraging us to surround ourselves with supportive peers and venerable mentors, but like so many religious texts, it’s not something that’s fully-equipped to inform emotional, psychological, or physical healing. I read this, it's wonderful and was originally published, as it says, as No Time To Lose. It's a better title for sure but could be confusing if you already have this book. I have read some sections many times over the years, not like her other books, more scholarly in a sense but certainly makes Shantideva easier to understand. This isn't a book I feel I'll ever 'finish', per se. It's a book that Buddhists and aspiring Bodhisattvas can return to time and time again for wisdom and inspiration. Ani Pema Chodron dissects Shantideva's cherished "The Way of the Bodhisattva". Shantideva's classic is written in verse, as a personal meditation, outlining the path of the Bodhisattvas—those who renounce the peace of individual enlightenment and vow to work for the liberation of all beings and to attain buddhahood for their sake. This isn't a book I feel I'll ever 'finish', per se. It's a book that Buddhists and aspiring Bodhisattvas can return to time and time again for wisdom and inspiration. Ani Pema Chodron dissects Shantideva's cherished "The Way of the Bodhisattva". Shantideva's classic is written in verse, as a personal meditation, outlining the path of the Bodhisattvas—those who renounce the peace of individual enlightenment and vow to work for the liberation of all beings and to attain buddhahood for their sake. (I paraphrased that description from the book jacket of the original edition). Pema Chodron takes each verse and breaks it down for us modern-day readers and practitioners. She puts it in less poetic, more relatable language so we have a more accessible relationship with the text, as well as the path itself. There's a lot packed into the book, and thus, I foresee it being a book I reference frequently, perhaps reading sections of it again the way one might read the Bible over a year's time, sort of a devotional. But I wanted to make it through the book once before I dug into it on the level I need to truly appreciate it. I look forward to a long relationship with these teachings. This is a deep dive into The Way of the Bodhisattva, with Chodron expounding on each verse. Pretty interesting and inspiring if you already have an interest or background in Buddhism; if not, this probably won't be your cup of tea, as there's not a lot of "story" here. As usual, Chodron has a good writing style and a logical, easy-to-understand way of explaining complex concepts. *Thanks to NetGalley for the ARC, provided by the author and/or the publisher in exchange for an honest review. A translation and commentary on a text written by Shantideva. Every time I picked this up I learned something new. For my having so little prior experience with this material, I was amazed at how Chodron's thoughtful commentary made this so accessible. Every page gave me something new to consider.